Salt of the earth, these motorcyclists! Harry Stanistreet recalls a nightmare trip to the Elephant Rally with his young wife Lesley and a group of friends in 1970, when just about everything that could go wrong did go wrong – but the kindness of people they met along the way ensured that everything turned out all right in the end. The year was 1970, and we’d had to sell the old Triumph T100 in order to pay for the household items we needed after our September wedding – but it was now December, I was without a bike and I felt the call of the elephant coming on. 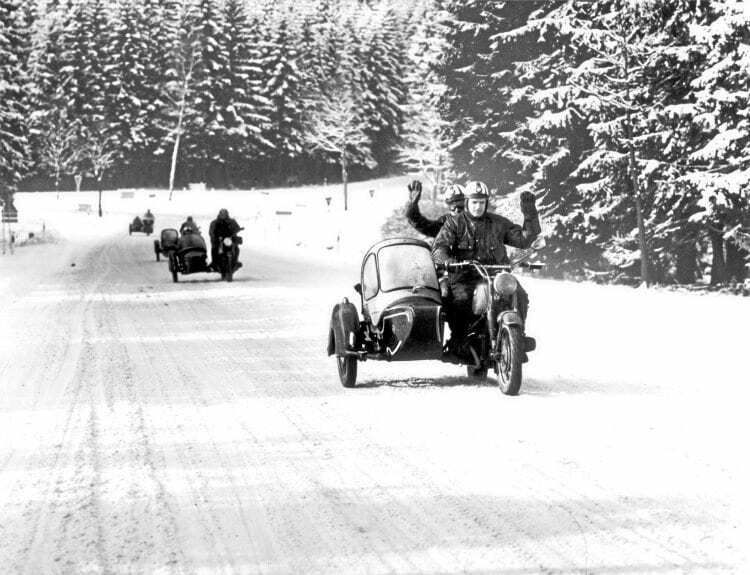 Speeding through the snow, German riders wave to The Motor Cycle’s cameraman as they climb to the Nurburgring. Photo: Mortons Archive. Anyone who’s ever been on the Elephant Rally, at the then West Germany’s Nurburgring, will know what I mean, for it always brought a test of man and machine as they battled through the snowdrifts to camp out in the cold once they arrived. there again with my bride Lesley on the pillion. We’d met at the 1969 TT, and as she’d been on numerous rallies with me since, she was keen to go. I had to get a cheap, purpose-built bike built, and quickly. Experience showed that we needed a trials type of machine that would cope with the snow and wouldn’t be too heavy because I’d probably have to pick it up on the odd occasion! We cleared the spare bedroom in our rented house so that we could use it as a workshop in which to build our newly-acquired bike. A Sprite rolling chassis donated by a mate, a Villiers 8E engine donated by another and a dual seat from a scooter formed the basis of our elephant transport, and as the deadline approached, some of the lads came over from my home town of Liverpool and we burned the midnight oil finishing it off. At the time, Lesley and I lived in Long Eaton, Nottinghamshire, and we’d arranged to get the bike tested at Alf Butler’s bike shop the next morning, before setting off for Dover. After passing the bike, he insisted that we call in again while en route so that he could wish us good luck. Read more in the March issue of OBM – out now!